We specialise in all small jobs around your London home or Office as well as larger tasks such as Kitchen, Bathroom and Shower Installations. We will complete all tasks quickly and efficiently, at a competitive rate. Saving you time and money! Do you have tasks that need fixing at your home and are too busy to do tackle them yourself? Had a negative experience with previous Tradesmen or Handyman Services? 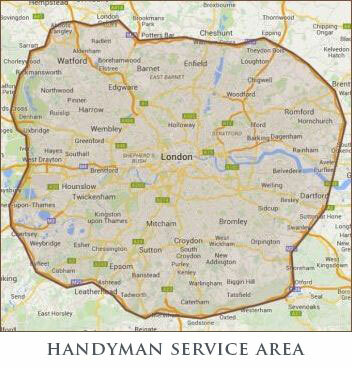 We are an honest, reliable, straightforward London Handyman Service that does not charge a call out fee, whilst providing a FREE estimate for the tasks..... YOU want done. Most of the tasks we undertake are completed within half an hour to half a day, although we will undertake jobs lasting up to a week. We can do a full range of everyday maintenance tasks including cleaning, plumbing and electrical work. If you have a task that is not listed on our pages. Contact us and we'll fix it for you. With the minimum of fuss!